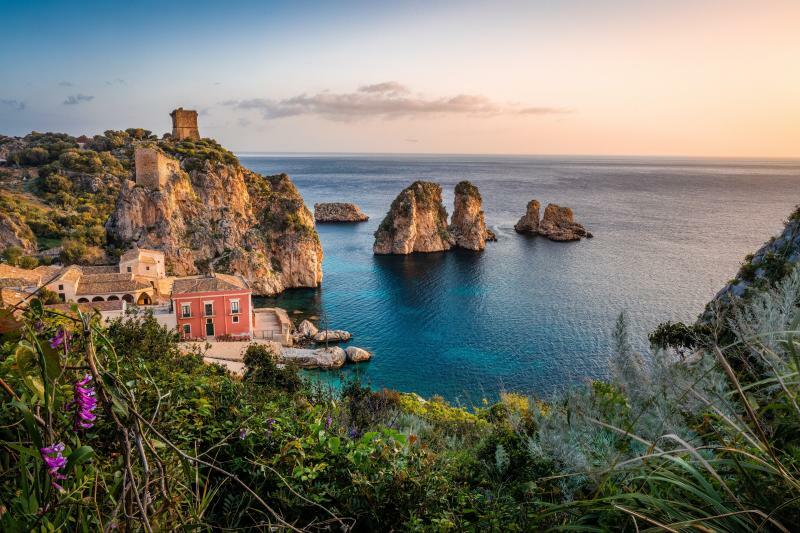 Discover the wonders of the Amalfi Coast, and Sicily on an Italian adventure from Rome. Walk the ruins of Pompeii, soak up the atmosphere along the Sorrentine Coast and Capri. Discover Sicily through its glorious architecture, charming villages and beautiful coastline! Discover the wonders of the Amalfi Coast, and Sicily on an Italian adventure from Rome! Benvenuti a Roma! After you touch down at the airport, make your own way to your hotel. Check-in and enjoy your first night in Italy. After breakfast, pick up at your hotel at 7:00 am approximate. Departure by coach heading south crossing the regions of Lazio and Campania. Arrival in Naples and short panoramic tour climbing up to Vomero hill to enjoy beautiful views over the Gulf of Naples with the Vesuvius, Capri, Ischia and Procida and the city below; time to take some nice pictures. Descending towards the port of Mergellina, you will leave the city and travel south towards Mount Vesuvius and, once you reach the town of Pompeii, you will have lunch with the real Neapolitan pizza! After lunch, you will enter into one of the most important archaeological sites in the world: a UNESCO World Heritage Site, the ruins of Pompeii, with Skip the Line entrance and a guided tour. Visit the haunting ruins of Pompeii, travelling back in time to the tragic days in 79 AD when the silent Mount Vesuvius suddenly erupted, covering the prosperous Roman city in deadly volcanic ashes and poisonous gases, leaving this prosperous city crystallized until our days. You’ll learn how people lived at that time, visiting houses and “bars” of the time, admiring frescoes and mosaics to imagine how rich and prosperous was the city before the dreadful day. Breakfast at your hotel, then spend a leisurely morning exploring Sorrento. In the afternoon, you will reach the port of Naples, where you will board on the Tirrenia/Snav ferry to Palermo. Let the waves rock you to sleep. Dinner and breakfast are NOT included on the ferry. Early breakfast and departure to Erice, a medieval village stacked into the side of Monte San Giuliano. Many say that little has changed in the village since the sixth century, and its labyrinth-like twist of lanes is perfect for a cool and pleasant morning ramble. Continue to visit the Saline, an extraordinary lagoon, where history, nature, archeology find a perfect synthesis and allow the visitor to try different, unique and charming experiences. Have a nice boat trip to the islands, located nearby. The tour of the natural reserve of the “Stagnone di Marsala” is a one of a kind archaeological and naturalistic experience. Board on these special boats, designed ad hoc to be able to navigate in the lagoon bottoms that at low tide reach only 25 cm. With a helpful audioguide, you will admire all the islands of the lagoon of the Stagnone up close, remaining comfortably seated in the boat, sailing at a speed of 4 knots. You will pass from the Island of Mozia, Isola Lunga, Isola di Schola, from the Ancient Via Punica Sommersa. Breakfast at the hotel and travel to Piazza Armerina a pretty and historic town nestled into the heart of Sicily. Entrance in Villa Romana del Casale to admire the largest, richest and most complex Roman mosaics in the world. It is one of the many UNESCO World Heritage Sites in Italy since 1997. The mosaics spread over 3,500 sqm show mythological scenes and portrayals of daily life. Depart to Ragusa and visit of the enchanting historical centre “Ibla”, with its stunning baroque palaces and churches; together with other seven cities in the Val di Noto, Ragusa is listed among the UNESCO World Heritage Sites. Breakfast at the hotel and travel to Noto, a picturesque fishing town popular for its stately Baroque architecture. Visit the Cathedral of San Nicolò, recently restored after an earthquake, and then have a nice walk in the town’s center. Continue along the south coast to Syracuse, on Sicily’s southeastern tip. Visit “Parco Archeologico della Neapolis”, Syracuse’s famous archaeological area, home to a vast collection of Greek and Roman ruins from all over Sicily. Head inside to see impressive landmarks such as the Greek Theater, the Roman Amphitheater and the Ear of Dionysius – an artificial limestone cave.